Free delivery applies for order to Klang Valley (Kuala Lumpur, Petaling Jaya, Selangor, WP) only. For out of Klang Valley delivery, gift will be delivered via courier and at least 3 working days notice is required. For customization, contact Pods & Petals Giftlab at +603-78830233 / +6012-6915200 or sales@gift-lab.com for enquiries. 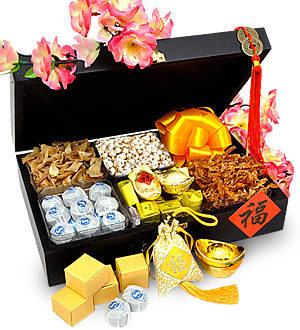 Rich Blessing I Gift can be customized post Chinese New Year as a Gratitude Gift, a Congrats Hamper or just to say "Thank You" . Let us know and we will replace the Festive accessories & trimmings accordingly to suit your occasion.